One of the segments included in my "10-Ways to Incorporate Art In Your Garden" presentation at the Epcot International Flower and Garden Festival was on creative mulch ideas. Gardeners know that top dressing garden soil with mulch is an effective step in conserving soil moisture and retarding weed growth. That's all good, but I also want my mulch to beautify my garden! Here are some ideas for "out of the box" mulch ideas that put some common collectible items to work in the garden. If you collect seashells or sea glass, take them out of that coffee can or glass jar that is sitting on your book case and use them as a decorative mulch in one of your container gardens! Ornamental grasses become "wild dune grasses" when finished off with sea glass. Use weed cloth between the soil and shells to keep the shells from becoming buried in the soil after watering. Wine drinkers- re-purpose wine corks as mulch in a fragrant culinary herb garden instead of throwing them away. "If you are going to be a lush, you might as well have a lush garden!" Designer Peter Crompton shared this idea with me. See your favorite vintage in this wine cork collection? This is a great conversation starter! 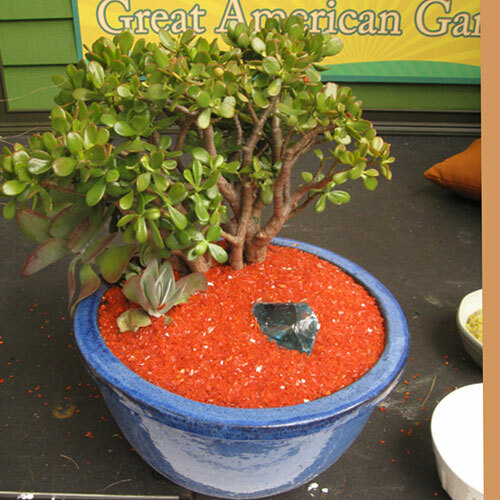 A common jade plant looks like a horticultural sculpture in this glazed cobalt container with vivid orange tumbled glass mulch and glass rock. Give your plant a year-round display with decorative mulches. You can also use broken ceramic, hand painted tiles, nut shells, and other material that will not rot or break down with water. Got any new ideas for me? I collect corks and also use marbles and used (broken up) auto glass — reminds me that I have a glass repair store a block away, I should go asked for more. I always think of asking Crisfield’s and the other seafood place near me for used shells, but I can;t stand the stench — so not sure I could handle the wait time for the shells to be clean & aged. I like the sea shell idea. I have one for you…broken clay pots. I had a bucket full of broken pots that I kept over the years. Whenever a pot broke, I threw it in the pot. I would use the shards to block drainage holes in other pots, etc. One day I saw a container with broken clay pot shards as the mulch! It looked so cool! Now, that is what I do with my broken pots. I have several pots done up on my patio and everyone loves them. Cinj- thanks for adding your ideas. The best inspiration are ideas that we can twist and make our own. I like the idea of the windows- I’m curious now! The presentations were very successful according to the audience themselves. It was great when they came up to me afterwards to let me know that I had inspired them. That was all I needed to hear. I’ll be blogging about my experience at Epcot, my presentation ideas and other great ideas I picked up. Come back and visit to check them out. This is a great idea. I like to come see what you got going and then it gets my wheels turning to see what I can come up with. Thanks for the tip. Did I tell you about making planters out of old windows? I’m getting ready to do some. I’ll let you know when I get them going. We missed you while you were gone. I hope you had a good trip. I moved while you were gone. I hope you got some good ideas and that your presentations were successful. I’m just getting back in the swing of things and checking back in. I don’t think you’ve written about it yet–but looking forward to reading about the Epcot days. Great ideas! I think other great options may include marbles, fish gravel, polished rocks, or those oblong clear glass pieces that people put in fish tanks.